Primevere Peony | Henry Field's Seed & Nursery Co.
Full, heavily-petaled peonies measure 5-7 in. across with soft, white outer petals and buttercup-yellow centers. Dark, glossy foliage springs up in a hurry; forms a good-looking backdrop for the spectacular blossoms. Shrublike mounds are 2-3 ft. high and ornamental even after the flowers fade— around midsummer. Creates a low-growing, low-maintenance hedge that never needs pruning! Plant in full sun. No. 1 root divisions with 2-3 eyes. Zones 3-8. Depth: It is very important to plant with the eye(s) 2 inches below the soil level. If they are planted too deeply, poor flowering will result. 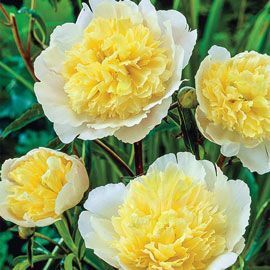 Color: Yellow centers and white outer petals. Foliage: Glossy, deep green foliage that is very attractive and ornamental throughout the growing season. The new growth in spring is burgundy colored and turns a soft yellow in the fall. Blooms: Late spring to early summer for 2 - 3 weeks. Flower Form: Pompom-like flowers 5 - 7 inches across. Fragrant. 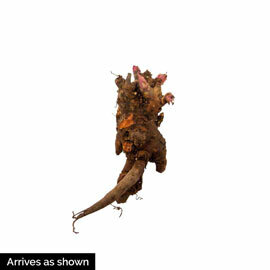 Soil Requirements: Well-drained, humus enriched, moisture retentive slightly acidic soil. Growth Rate: Slow first 1 - 2 years, thereafter growth is moderate when left undisturbed. Pruning: Remove spent flower stems after flowering. Allow foliage to die back before cutting to the ground. Size: 5 - 7 inch blossoms.